With the underwater turbine in the background, U.S. Department of Energy's Deputy Assistant Secretary for Renewable Energy Steven Chalk addresses the attendees of the Cobscook Bay Tidal Energy Dedication Ceremony in Eastport on Tuesday, July 24, 2012. Chris Sauer, president and CEO of Ocean Renewable Power Co., speaks at the dedication ceremony of the Cobscook Bay Tidal Power Project in Eastport on Tuesday, July 24, 2012. Periods of rain did not dampen the mood as Chris Sauer (left), president and CEO of Ocean Renewable Power Co., is congratulated by Sean ONeill, president of Ocean Renewable Energy Coalition, on the successful development of the first tidal power project in the U.S., in Eastport Tuesday, July, 24, 2012. 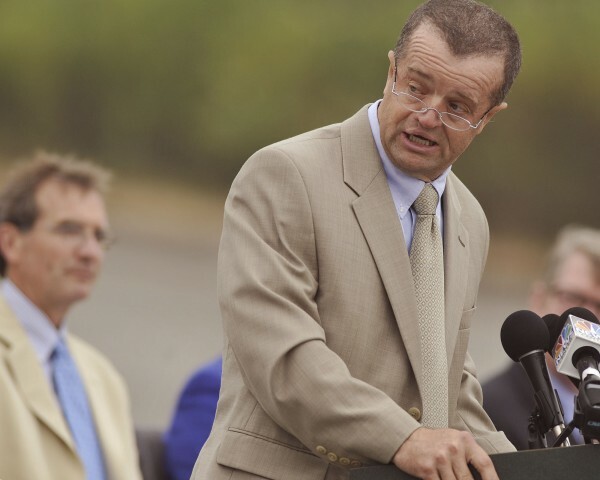 U.S. Department of Energy's Deputy Assistant Secretary for Renewable Energy Steve Chalk, flanked by ORPC vice president for development John Ferland, at a dedication ceremony for the Cobscook Bay Tidal Energy project in Eastport Tuesday, July 24, 2012. Image of a yet-to-be-installed Ocean Renewable Power Co. underwater TideGen turbine in Eastport Monday, July 23, 2012. Image courtesy of Ocean Renewable Power Co.
A schematic illustration of Ocean Renewable Power Co.'s underwater TideGen device, which can have a peak output of 180 kilowatts, according to company officials. An underwater topographic site map for Ocean Renewable Power Co.'s Cobscook Bay Tidal Energy Project. One of their TideGen underwater turbine devices can have a peak output of 180 kilowatts, according to company officials. 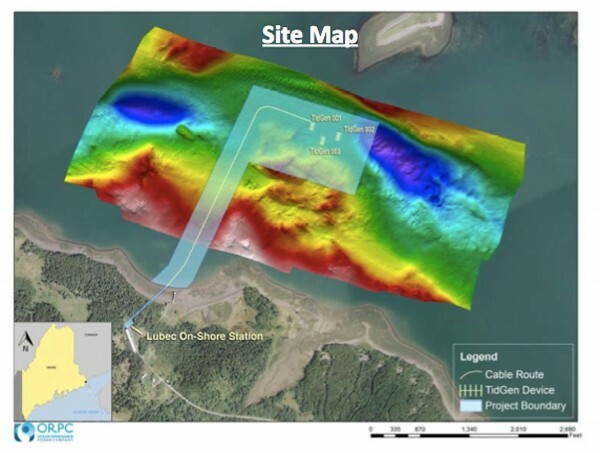 EASTPORT, Maine — Will the Eastport-Lubec region of northeastern Washington County one day be to tidal energy what Kitty Hawk, N.C., is to flight? With the imminent deployment in Cobscook Bay of the nation’s first underwater turbine to use tidal power to generate electricity, that seemed to be a vision shared Tuesday morning in Eastport by the more than 200 people who turned out amid intermittent showers for the formal dedication of the nation’s first underwater tidal turbine. 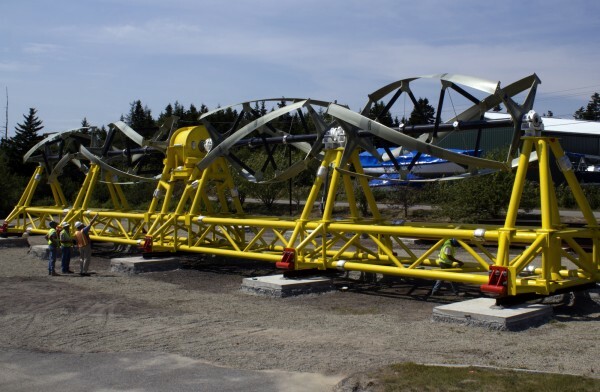 For eight years, Ocean Renewable Power Co. has been working out of Eastport and Cobscook Bay while conceptualizing, fabricating, testing and refining what has evolved into a 90,000-pound, 98-foot turbine. It will be submerged in Cobscook Bay in August at a depth of 82 feet for a year of testing underwritten by the U.S. Department of Energy as part of a $10 million grant. Chalk said the Department of Energy anticipates that water-based generation using ocean tides and river currents will provide 15 percent of the nation’s energy by 2030. “ORPC is leading the charge to tap into that resource to make tidal generation a viable resource,” Chalk said, referring to Ocean Renewable Power Co.
Should testing of the first TidGen unit over the next year prove the turbine to be technologically viable and environmentally friendly, four identical turbines will be phased into use over the next few years. Collectively, they are expected to harness the force of the Bay of Fundy region’s iconic tides to generate as much as 4 megawatts of power, enough electricity to power 1,000 homes. During Tuesday’s 90-minute dedication ceremony, federal, state and local officials who have been vocal advocates of the project sang its praises and thanked Ocean Renewable for its technological vision and the significant economic effect the project has had on the Eastport and Lubec communities. By one estimate, the project has pumped as much as $18 million into the economy in recent years, with much of those funds spent locally. Members of Maine’s congressional delegation issued congratulatory statements Tuesday. 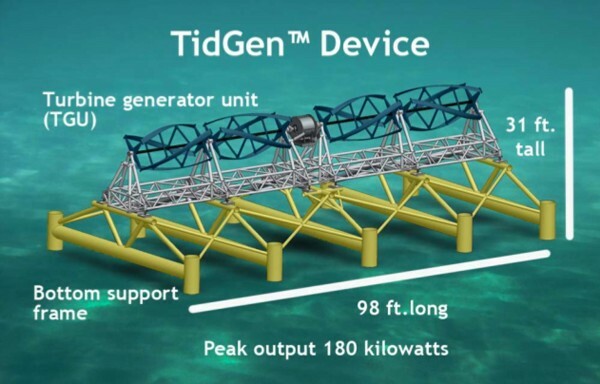 “Today’s unveiling of the latest and largest iteration of the TidGen Power System — the first commercial-scale in-stream tidal device — represents a monumental achievement which is a testament to the collaboration and hard work of countless individuals whose unique areas of expertise have made today a reality,” U.S. Sen. Olympia Snowe said. 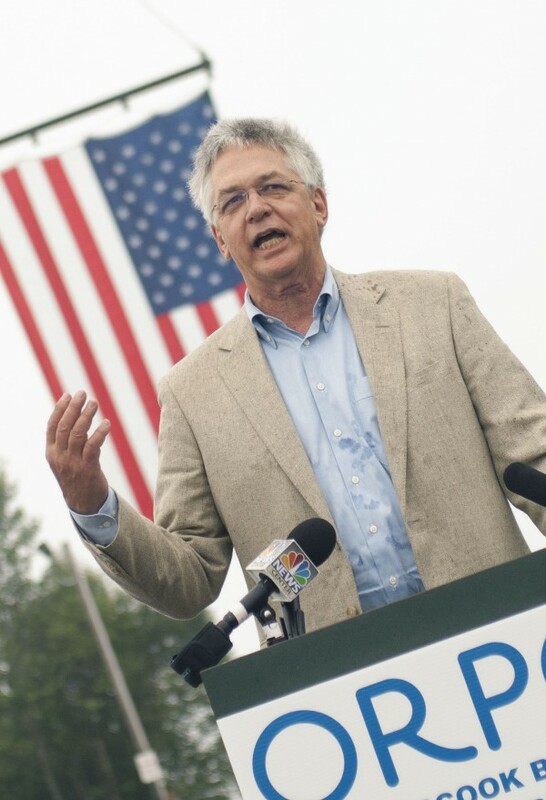 U.S. Rep. Mike Michaud recounted in a statement read at Tuesday’s event his years of working with Ocean Renewable Power Co. to bring its vision to reality. “I’m thrilled to see that research and development turned into results that will help increase our energy independence, spur investment, and pave the way for new advancements that will make a real difference for our communities and families,” he said. 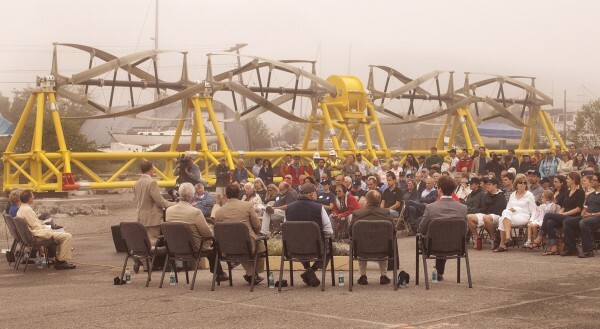 Amid a backdrop of Cobscook Bay fog, Down East squalls and a massive, billowing, crane-mounted American flag, Ocean Renewable executives, including President and CEO Chris Sauer, heaped accolades upon those who over the years have provided local, regional, state and even international support for the project. Chris Gardner, chairman of the Washington County board of commissioners and the director of the Port of Eastport, focused his remarks on thanking Ocean Renewable Power Co. for its effect on Eastport and Lubec. Although the ceremony was periodically interrupted by showers and, at one point, a loud clap of thunder, the project’s boosters, including former Maine Govs. 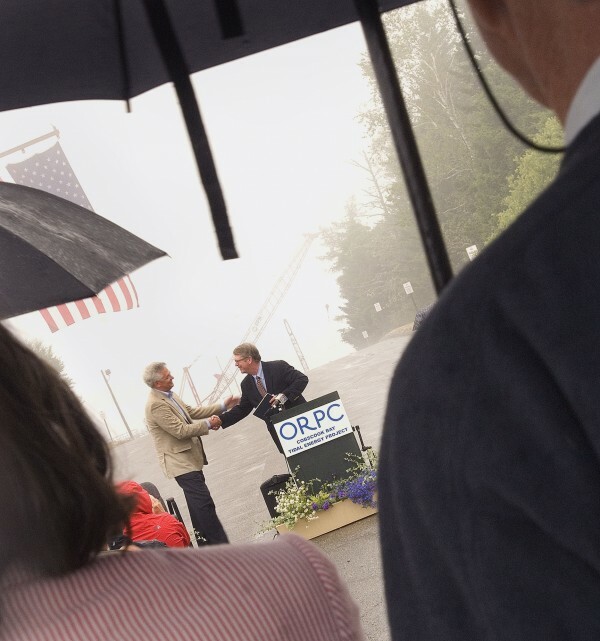 Angus King and John Baldacci, endured the elements to mark the occasion.